Inspired Playgrounds is the creation of Key Stage Coaching's Ben Kirk, and Marcus Holmes. Both are active P.E. 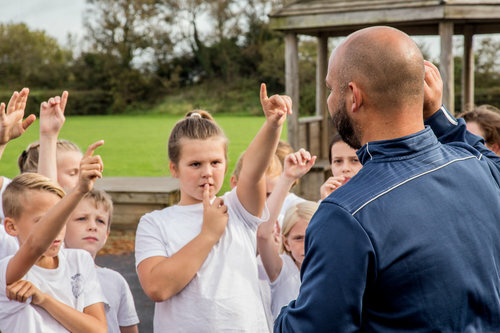 teachers who through first-hand experience were aware that encouraging children to be more active at school was becoming increasingly important. Worryingly, childhood obesity is on the increase. Recent NHS and Government reports have highlighted the issue; citing sedentary lifestyles and poor diet, and unless something is done about it, the problem will only continue to get worse. Obesity can be tackled by improved diet and increased exercise. To ensure children learn a positive habit, Inspired Playgrounds developed their designs and practices to ensure that children want to become more active because they are having fun. Installing an Inspired Playground will get pupils active for 30 minutes every school day and schools will be able to monitor activity levels, through recording activity by sports leaders and using the Inspired Playgrounds Web App. There are three different packages available to suit every school budget and funding is also available through Sports Premium Funding. 'We have been using Inspired Playgrounds for a year and it has had a massive impact on the activity levels in our school. Our Playground Leaders track activity using the markings, with the app, and award pupils in celebration assembly with trophies, house points or an extra playtime. They then display winners on their board in the hall. If you would like to find out more information about Inspired Playgrounds or how your school can apply for funding for the project please don’t hesitate to contact us.